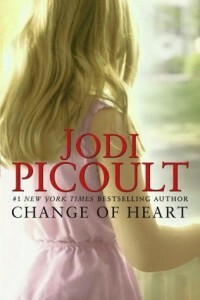 Change of Heart by Jodi Picoult did not receive quite the notoriety as My Sister’s Keeper or 19 Minutes but not for lack of a compelling story. The controversial topics of religion and capital punishment are what kept this book off of some people’s nightstands – but not mine!! Picoult is my favorite contemporary author and she does not disappoint with this one; she carries her characteristic twists to the end once again. Within each of her 16 novels, Jodi Picoult delves deep into the most troubling contemporary social issues. In Change of Heart, she examines a convicted killer on death row, Shay Bourne, who has taken the lives of Officer Kurt Nealon and his young stepdaughter, Elizabeth. When Shay discovers that his victim’s living daughter, Claire is desperately in need of a heart transplant, he sees his only chance for salvation – donating his own heart after his death sentence. Standing in his way, of course, is the law and a mother filled with anger. On his side are three unexpected allies: a Catholic priest (who had a hand in Shay’s sentencing! ), an ambitious attorney who is determined to see Shay die on his own terms, and a community that sees Shay as a messianic character who gives them hope. Picoult’s research never ceases to amaze me. Her meticoulous portrayal of death row laws along with the book’s attention to Christianity, Judaism, and the Gnostic gospels gave me new insight. This story is told from four different points of view: the Catholic priest, the attorney, another death row inmate, and the mother of the victims. Through their thoughts, the reader is given some very deep food for thought . . . “There’s a big difference between mercy and salvation” . . . “Would you give up your vengeance against someone you hate if it meant saving someone you love?” . . . “If you bring forth what is within you, what you bring forth will save you. If you do not bring forth what is within you, what you do not bring forth will destroy you” . . . quotations such as these make for a very provocative book. In fact, Picoult uses several famous quotations here from some of the greatest thinkers in history including Lewis Carroll, Mother Teresa, Albert Einsten, the Dalai Lama, Woody Allen, Albert Einstein, etc. I enjoy books that make me think, challenge my philosophies, and offer new perspectives. Change of Heart does all that and more. In the story, religion seems at times to bring characters together and at others to drive a wedge between them. All the while, what defines “justice” is continually challenged. We all know it’s wrong to execute someone innocent, but what about someone who is guilty? The book never screams one side or another. Rather, through the completely varied characters in Change of Heart, the reader is left with perspectives on all sides of these compelling issues so that one closes the book exploring one’s own values and beliefs. Grading Girl gives Change of Heart a B+. While this did not make me outwardly cry like My Sister’s Keeper did (something I never normally do when reading), this did leave me with some deep, concerting thoughts. It’s a captivating story of redemption, justice, and love. On to more books off of my very high summer reading pile . . . Picoult’s Handle with Care is one of them and I look forward to exploring more thorny moral and ethical issues with this compelling author.